If you are gainfully employed chances are that at one point or another you will need to hold a presentation. Most commonly Microsoft’s presentation software PowerPoint is used in helping you with that task. 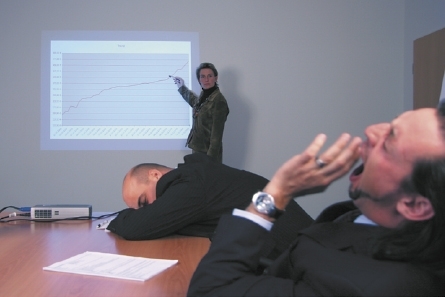 Most common mistake made is to think that PowerPoint is your presentation. Quite to the contrary, it is a mere tool and the presentation is all about YOU, the presenter. Use an increase in self-awareness to combat this issue. When you increase your self-awareness you will likely be able enjoying really successful presentations. You will also no longer think about you PowerPoint as being the presentation, but you will become a much more confident presenter. What is more powerful than that? It will also make sure that you could run a presentation even if key technology fails on you and you would have to run totally without your PowerPoint stuff (think about that one! ).